Ever since Porsche started hinting at the fact that they'd be aiming for track records in 2018, we've been discussing the possibility of Porsche using the 919 Hybrid LMP1 to tackle the outright Nürburgring lap record that has been unbeaten since 1983, when Stefan Bellof set an incredible pole lap of 6:11.13 in the now-famous Rothmans 956. That time was five seconds clear of anything anyone had ever done before, and it's not been matched or exceeded since. It has been said in the past that nobody would attempt to mount an effort on that lap time out of respect for Bellof, but perhaps honoring him by letting the record stand for 35 years and essentially needing a four-wheeled super machine time-warping hybrid super prototype to beat his record is the best way to let this happen? Furthermore, the Nürburgring has had its specification changed a couple of times in the last 35 years, so the two records could technically be separated by that caveat. So what did Porsche do to the 919 Hybrid to make it both faster than an F1 car, and produce more downforce than an F1 car? What has us so convinced that this Porsche is even capable of beating Bellof's Nordschleife time? They tore up the rule book, that's what. WEC regulations require LMP1 cars to run at a specific fuel efficiency rate, limiting fuel flow per lap. Last year, Porsche was allowed just 2.464 liters of gasoline for a lap of the Spa circuit. That equates to 6.7 miles per gallon, which is quite high for a race car. By supplying the engine with more fuel, Porsche was able to shove more boost into their 2.0-liter V4. Running the same E20 bio-ethanol fuel they used in 2017, Porsche was able to crank that little engine up to 110%, making a whopping 720 horsepower rather than the 500 horses the 919 produced in WEC specification. Porsche was also limited to the amount of electric power they could use at Spa in 2017, making just 6.37 megajoules, which was below Porsche's stated potential. During the 2017 pole lap, the electric assist had to be meted out where it was most effective to help the lap time. This time, however, driver Neel Jani could push the hybrid assist on wherever it was possible, having more than enough juice for the lap. Furthermore, the electric output was pumped up 10% from 400 horsepower to 440 horsepower. When you're going for a lap record rather than fitting inside the tight confines of an FIA rulebook, the aerodynamic bits can be pushed to their limits as well. The 919 Evo was developed with a new front diffuser that is much larger than the WEC-specification model, which helps to balance the new larger rear wing. The rear aerofoil is not only deeper in chord, but it is much wider as well, producing much more downforce effect. Thew new wing features a rearward standoff, which increases efficiency, and a bulging wing stanchions to accommodate its massive width. Not only that, but Porsche made both the diffuser and the rear wing aerodynamically active, with a hydraulically activated trim system to make the 919 more efficient on straights without reducing downforce through the corners. Porsche says the 919 Evo achieves 53% more downforce while increasing efficiency by 66% compared to the 2017-spec car. Also critical to the lap time boost was the car's loss of 86 pounds of extraneous components. Anything that was not critical to single-lap performance was dumped. You'll notice that this 919 does not have headlights, because lap records are all done in the daylight. They also tossed away the air conditioning system, the windscreen wiper, most of the car's condition sensors (helpful over a four-hour stint, but useless for a single lap), many of the 919's race control devices, and the internal pneumatic jack system. The whole kit and caboodle now weighs just 1871 pounds. In order to help the 919 Evo achieve such incredible feats, Porsche worked directly with Michelin to develop a new compound of tire that was capable of working on a car that produces more downforce than an LMP1 car typically does. Keeping the same tire dimensions as the 919 Hybrid used in 2017, a 31/71-18, the two companies set out to increase the level of grip significantly. Of course Michelin was able to deliver the new compound tires with the kind of grip Porsche desired, without any reduction in tire safety. Porsche also developed a four-wheel brake-by-wire system so the car's computer could independently brake each wheel as an additional measure of yaw control. The 919 Evo did gain back some of its lost weight as Porsche had to develop a more aggressive power steering system to handle the higher g-force loading, as well as beefed up suspension wishbones at all four corners. Comparing the 2018-spec 919 Evo to a 35-year-old Group C car is almost impossible. The two cars could not be further separated from each other. They're both turbocharged, they both weigh around 800 kilos, they both make use of advanced aerodynamic concepts, and they both take a driver with massive cojones to wrestle them into submission. The 956 features a 2.65-liter turbocharged flat six engine mated to a manually-shifted 5-speed transmission. In period, it made around 650 horsepower and was one of the fastest things on four wheels upon its introduction in 1982. The car swept the podium on debut at Le Mans, with Jacky Ickx and Derek Bell running in the lead from flag to flag for the entire 24 hours. Until the 956 was retired in favor of the updated 962, it was successful and incredibly fast. The 919 Hybrid is Porsche's most recent Le Mans winner, taking three victories in three years, just before retiring to pursue lap records at the end of last year. You're likely already familiar with the 919's carbon monocoque design, spaceship looks, and hybrid powertrain. It's a 2.0-liter V4 turbocharged engine with a pair of hybrid assist systems, including motors at the front wheels to provide all-wheel-drive traction, as well as electrified turbocharger turbines to help eliminate boost lag to the small engine. In Le Mans trim last year, the 919 developed around 900 horsepower, but Porsche claims over 1,160 combined horse power from the full system in Evo spec. For the record, I spent way too much time trying to do the math on all of this, and the result is still speculation. Allow me to get nerdy for a minute. You can see by these numbers that the 956 was slightly quicker around most of these tracks than last year's 919 Hybrid. The problem with direct comparisons, however, is that all of these circuits have been slightly modified in some way or another. Most famously, the Le Mans circuit was modified with a pair of chicanes in the 90s. Similarly, chicanes have been added to all of the fastest portions of these famed circuits, so while both Porsches raced and qualified on the same ground, the 919 is at an average-speed disadvantage, because this adds to the number of times the car has to slow down and accelerate back up to speed. The fact that the 919 posts nearly the same time as the 956 at Le Mans proves just how much quicker that car is, as it has two additional runs up through the gearbox to complete a lap. I am forced to assume that if the 956 and 919 were running on the same course, the 919 would beat it every time. In order to get a speculative answer for about how quick a 919 Evo could possibly be at the Nürburgring, I figured out the average lap speed for each of these circuits. By averaging the average lap speeds of the 956s run at Silverstone, Spa, Le Mans, and Fuji, I was able to determine the car's approximate average qualifying speed across all four circuits. Compared to the car's average, the Nürburgring lap time is run at about 6% slower than the other courses. Here comes the speculative extrapolation. By figuring that the 919 Evo's F1-beating lap time at Spa this weekend was around 27% faster, and the Nürburgring Nordschleife is about a 6% deficit from standard race courses, I applied these factors to the 2017 Porsche 919's average lap speed. Across the four WEC events above, the 2017-spec 919 managed an average average lap speed of 214.594 Km/H. Factor that the 919 Evo is 27% faster and you get a four-race speculative average of 272.535 Km/H. Reduce that by the Nürburgring's 6% factor, and you get 256.182 Km/H. With the equation 'distance/speed=time', we can do some solving for X. We know the Nürburgring's lap distance is 20.810 Km, and we have calculated a not wholly arbitrary average speed at which the 919 Evo could accomplish the lap. Will Porsche Actually Run The 919 Evo At The Nürburgring? That's the million-dollar question, isn't it? The fact is, running a car this fast on a track like the Nordschliefe is still an incredibly dangerous proposition. There is a reason the 35 year old record still stands, because no open-wheel racers have gone and given it an attempt. I'm sure Neel Jani has attempted to run the factory simulator loading up the new car and the legendary track, and I'm sure he's confident he could smash that record time. I'm also sure that I don't want any part of driving an 1100 horsepower car around that track. That sounds frightening. The schedule for Porsche's 919 Tribute world tour does have a date on it for the Nürburgring, but that is listed only as a "demo lap". Perhaps they will give Neel the ultimate decision to go for it or not. As much as I'd love to see that record broken, especially with something as bonkers as the 919 Evo, I'd also hate to see him fail. Then again, this is exactly what this car was built for, dominating the stopwatch. What do you say? Should Porsche risk it all and go for it, or are they better off playing it safe? 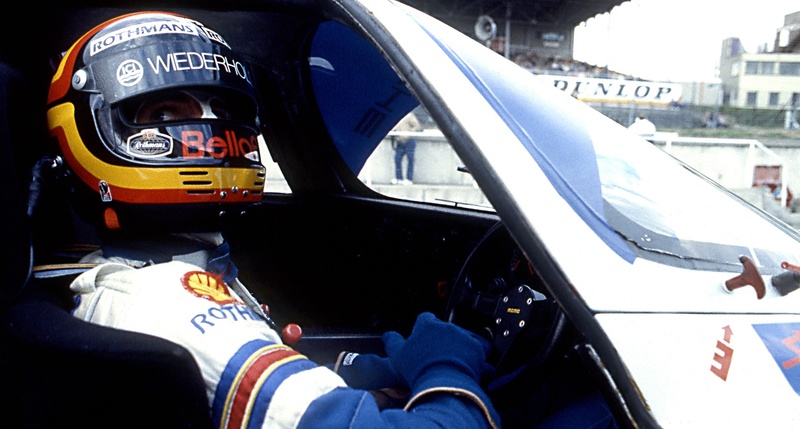 Leave the legend and the glory to Bellof and the 956. It is extremely impressive that Jani and the 919 Evo was faster at Spa then Lewis Hamilton’s record 2017 qualifying speed, but the Nordschliefe with its 154 turns and varying surfaces and elevations is hard to master. However, if indeed Neel Jani does perform that feat successfully, I will be more than happy to eat my words. I think for it to be an even contest the 919 should run as it raced if it is going to be compared to a 962. How fast could the 62 have gone if it was allowed to do “anything you want”? As a demonstration the 919 attempt would be very cool but few have the balls of Bellof.